Nagpur: The Maharashtra Association of Resident Doctors (MARD) has threatened to go on strike if the state government does not resolve the problem of shortage of medicines being faced by government-run hospitals in the city. MARD, comprising 4500 doctors across the state, has given an ultimatum to the Maharashtra government over the acute shortage of medicines being faced by Government Medical College and Hospital and Mayo Hospital in the city. In a letter to Chief Minister Devendra Fadnavis, MARD said, “There is a vast gap between demand of government hospitals and supply on medicine front. The acute shortage of medicines poses enormous hardship not only to patients but resident doctors as well.”MARD has listed their 15 demands and warned of ‘rasta roko’agitation if their demands are not met by December 20. It further demanded that the government should set up a state-level audit committee and its report should be posted on the government website every six months. 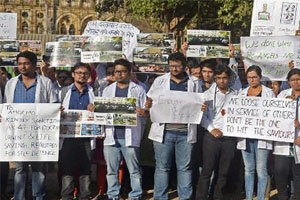 Shortage of medicines has led to the beating of resident doctors Mumbai’s J J Hospital and Aurangabad Hospital, it was stated. Moreover, the system to provide passes to the relatives of patients in government hospitals in Nagpur, Yavatmal and Akola has not been implemented even after one-and-a-half-year. The alarm system at J J, Akola Hospital, Mayo Hospital and Latur Hospital has not been activated as yet, MARD said in its letter. The MARD has sought an independent probe into all these aspects.